Is the idea that neurons perform ‘computations’ in any way meaningful? I figured that meant I should finally post it to help clarify some things. I will have more comments on the general question tomorrow. Note that I am pasting twitter conversations into wordpress and hoping that it will convert it appropriately. If you read this via an RSS reader, it might be better to see the original page. The word ‘computation’, when used to refer to neurons, has started to bother me. It often seems to be thrown out as a meaningless buzzword, as if using the word computation makes scientific research seem more technical and more interesting. Computation is interesting and important but most of the time it is used to mean ‘neurons do stuff’. Which pretty much sums up how I feel: either brains aren’t computers, or they are computing stuff but let’s not really think about what we mean by computation too deeply, shall we? Is the idea that neurons perform 'computations' in any way meaningful? Or has it just reached buzzword status? @neuroecology In much of Cog Neuro, it's a buzzword: "we provide important constraints on possible computational roles of these regions…"
Let’s first remember that the very term ‘computation’ is almost uselessly broad. @neuroecology @schoppik @MHendr1cks Rhetorical advantages to leaving the level of abstraction (both physical and conceptual) underspecified. @neuroecology … but needs to be distinguished from the sense of 'automata' typical in a CS education. Just because it ‘computes’, does that tell us anything worthwhile? @schoppik @neuroecology does a cue ball compute force bc we can infer force from its stable, reproducible responses? @dlevenstein @schoppik @neuroecology I am not opposed to computation language, I am just unsure what it means in cells. @neuroecology myocytes are a group of electrically active cells but they're all kind of acting en masse, nothing specific. No "message"
@mhendr1cks @debivort @neuroecology not sure what is so tricky. Some words (e.g. "computation") signal an approach/level of analysis. @MHendr1cks @debivort @DaveMellert @schoppik @neuroecology What happens across synapses is often described as gain and/or offset changes. @MHendr1cks @debivort @DaveMellert @schoppik @neuroecology Then there is integration in dendritic trees. I'd call all these computation. @DaveMellert @schoppik @neuroecology @debivort it sounds like you are saying: ball is a force detector if we're using it to compute force. We need to remember that there are plenty of journals that cover this: Neural Computation, Biological Cybernetics and PLoS Computational Biology. I have always had a soft spot for this paper (how do we explain what computations a neuron is performing in the standard framework used in neuroscience?). What do we mean when we say it? @kmcld99 @dlevenstein @schoppik @neuroecology so something just being "complex enough" makes it computation? what's the threshold? @kmcld99 I don't know…I use it informally all the time, wondering if there are formal criteria or if it's aesthetics. @dlevenstein @kmcld99 @schoppik @neuroecology …but I think that says little about neurons. @MHendr1cks @kmcld99 @schoppik @neuroecology Neurons can act as AND, OR, XOR gates – computation at its most basic and just a few examples. Let’s be rigorous here: what should we mean? @debivort @schoppik @MHendr1cks @neuroecology As opposed to computation by liver cells etc.? The term is definitely overused. @debivort @mhendr1cks @neuroecology go on? refine "computation" so that it is suitably helpful, and excludes cue balls, please. A billiard ball can compute. A series of billiard balls can compute even better. But does “intent” matter? @schoppik @MHendr1cks @neuroecology @debivort i would say billiard balls set up to perform computation would perform computation. @DaveMellert @schoppik @MHendr1cks @neuroecology maybe. Makes designerless evolutionary cases a little fuzzier, but sure. @debivort @DaveMellert @schoppik @neuroecology my basic q was if anyone considers computation a natural category of phenomena. so, no? @DennisEckmeier @debivort @DaveMellert @schoppik @neuroecology would you call a door with 2 locks computation? @DennisEckmeier @debivort @DaveMellert @schoppik @neuroecology it's an AND gate (literally), which is computation. Alright, let’s be pragmatic here. @neuroecology That they perform computations is meaningless. That they perform a specific set of computations and not others is meaningful. Michael Hendricks hands me my next clickbait post on a silver platter. @debivort @schoppik @neuroecology next up: "decision making"
I seem to lose my understanding of what computing is supposed to mean to people. As I said back then and as I said in that tweet, to me if you take a number or a signal, and transform them in any meaningful way, I’d call it a computation. However, the problem for people to me appears to be that transformations of any sort in the neuron are basically passively caused by physical deterministic mechanisms (which btw are dynamically adjusted in real time) which seems not to be what people think computation can be. Now I wonder, if you say neurons don’t compute, but we use neurons to calculate a + b = c – this can mean we are not actually computing anything, either, and we use deterministic processes in a complex way to make things appear as if they were computed. It could also mean ‘computation’ is one of these things that emerge when we put simple things together to form complex systems that have ‘new’ properties and we think about it like we think about concepts of consciousness and life. If we say, computations don’t take place in the brain at all, because all those neurons only respond in a physically deterministic way, then computation in silico – by microchips – aren’t actual computations either. Because of course they also have deterministic reactions to inputs. In total I am getting the idea that either ‘computation’ as such doesn’t really exist, or it is a metaphysical thing that emerges from ‘sufficiently complex’ systems. I am not happy with either and keep calling any meaningful transformation of a signal a computation, disregarding the apparent ‘complexity’ of the system. Biological systems are always complex, anyways. Wikipedia’s definition of ‘computation’ includes human user and devices engineered to perform according to predetermined algorithms etc. Obviously the implementation of algorithms in organisms through evolution is not covered by this definition. 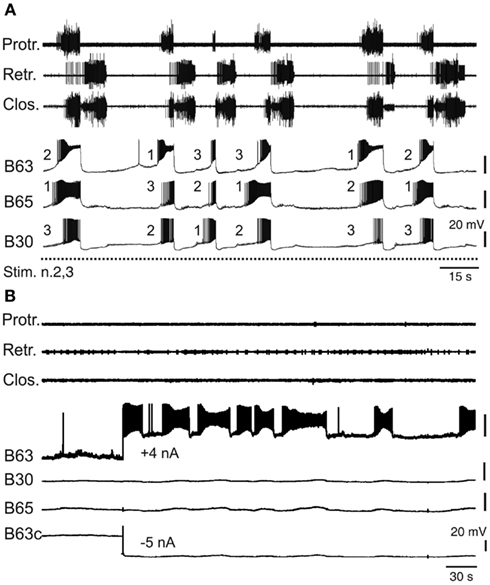 B63 is a neuron that initiates behavior. The trace you see is what it does when it is depolarized by a constant current. This is what animals do, encapsulated in a single neuron: animals do stuff to find out how the environment reacts such that they can survive. In many cases, they need to compute certain things in order to do evaluate the response of the environment to their actions, but that’s just a consequence of what they actually do. Metaphors are useful, but they only go so far. Using metaphors of our engineered world will get you the engineering-like properties of the system under study. Given the plasticity and versatility of nervous systems, you can push them to behave almost like any engineered system, as long as you don’t look to closely (see, e.g. the stimulus-response metaphor of old http://ecx.images-amazon.com/images/I/81Gu0NJ7iTL.jpg ). However, if you look without an engineering metaphor, but with the realization that brains evolved, you quickly find that, yes, brains do sometimes compute certain things, but that’s neither what they do nor is it what they evolved to do. 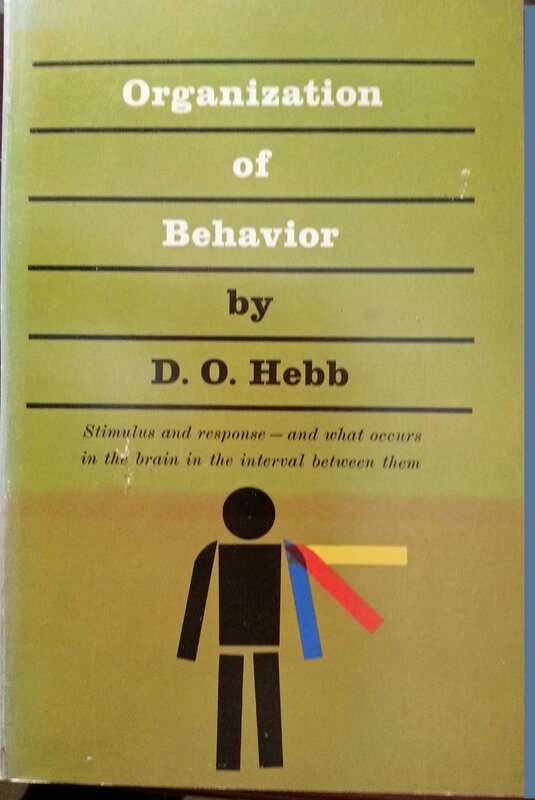 Brains chose behavior to make their organism survive. There are a lot of things they need to do to accomplish that and sometimes computations are part of that. I have been thinking about this a lot, and my insight is that information transformation is not all there is to computation. There is another key ingredient that separates “computation” from transformation, and that is the use of MEMORY. There are many algorithms or IO transforms that can be performed without memory (a filter, a feedback controller) and a computer can implement these algorithms. However, there are many more algorithms that require memory (a sorting algorithm), and I think that this class is what truly separates something that computes from something that is just a machine. The brain and neurons compute, because they do information transformations and they use memory. A system without memory cannot perform true computation. A machine can execute an algorithm that requires no memory, but only a computer can execute an algorithm which must use memory.